Summer is on the horizon, so it seems like a great time to reflect on all of the wonderful projects, events and programs that we've been up to for the past couple of months. 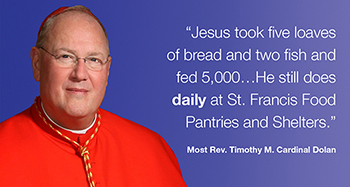 Not only did Cardinal Timothy Dolan provide us with a "Quote of the Month" for June, he also sent his Doodle For Hunger 2014 artwork for our Fifteenth Annual Celebrity Art Auction happening this November. It is always exciting to see our new and past Doodlers will draw. See what has arrived so far (from Tom Hanks, Lady Gaga, Mark Teixeira, Carol Burnett, Channing Tatum and more!) in our Doodle For Hunger album on Facebook. Easter celebrations were abundant this season at Oasis, one of the locations included in our network. Easter at Oasis was definitely not to-be-missed, and the Easter bunny even showed up! Our 15th Annual Theatre Benefit featuring Bullets Over Broadway took place on Thursday, May 1, 2014. It was a truly remarkable evening to spotlight our Honorees Gaston Silva and Frank Lisi and support St. Francis Food Pantries and Shelters. Just one month later on Monday, June 2, 2014 our 16th Annual "Golf For Hunger" & Pool Party and "Swim For Hunger" took place. Perfect weather provided the back drop for a leisurely day of golf, swimming and relaxation - all for a worthy cause. James G. Phillips, Founder of TPG Architecture, hosted the event that honored David G. McWilliams, CEO of JRM Construction Management, while Thomas Capobianco, of The Mohawk Group and Sabrina Messimer, Sr. Account Executive at SBFI, led the "Swim For Hunger." This year we set out on a mission to distribute over 25,000 diapers, to families in need, as part of our Mother's Day Diaper Drive 2014, click the story to see how we did! Our newest PB&J partner McGraw Hill Financial hit the ground running making thousands of bag lunches for our food pantries during their "Peanut Butter & Jelly Sandwich Making Day". See what the final count was! 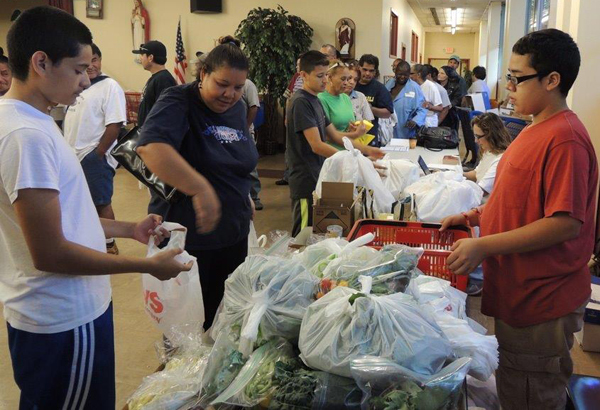 All of our programs, activities and events all share a common theme: nourishment for the mind, body and soul of individuals and families who need a helping hand. Our Food Distribution to the network of over 40 pantries, shelters and soup kitchens around the New York area is the highlight of our work.